A favorite blouse of the village after washing? Or why hardly began to zip up the zipper on the skirt? Reasons to look for you, but first, you have the power to correct these small troubles. To increase the size of the clothes myself easy and at home. - the product requiring rework. First, the importance of the appearance of the product that you have to change, and its degree of wear. Turn it inside out and inspect the condition of the allowances. Compare the colour against the face of the product. If the color is significantly different, then to place the product on the side seams does not work. Even podposite side seam of the product in an inconspicuous place such as on the hem bottom. Some fabrics are very sensitive to the sewing needles that leave a mark on them holes. This product is also, unfortunately, it is impossible to increase in size. Also note the size of the lateral recess. If you have the opportunity to arrange them, reducing the allowances to about 7-8 mm (depends on the type of tissue, sometimes acceptable and 5 mm), then increase the size of the garment will be easy. When the status and value of the side seams of the product satisfy the above described conditions, feel free to start the alteration. First, consider how to increase the size of the skirt. The skirt with set-in belt inspect the condition of the belt. If it is sewn with a button closure at the overlap, you can easily determine how far you can alter the button closer to the edge of the belt. Remove the measurements of waist and hips. Measure the volume of the skirt. The difference in volume divided by 4. On this value you have to lay a new seam down the seam allowance from the old. If the skirt will remain acceptable for the size of the seam, you can start ripping. Take advantage of this special seam Ripper, it is very easy to use and will help you to keep the fabric from tearing. Now you need to iron seams using iron with steam generator, so as not to leave traces of the old seams. Fold the skirt on the old seams and lay the chalk the location of the new stitches with the increase in size. For convenience, sweeps them straight wide stitch, and then sew on a typewriter. Again Ratatouille side seams. Tuck in the skirt, it is better to leave unchanged. With a belt I bet a button or hooks, podposite him on the longitudinal seam, forming an overlap. Now baste to the skirt subject to the spaced side seams. When primitivnyi skirt lightly proposait. Now pristrochite waistband to the skirt. In the same way you can increase the size of the pants. On the blouse or jumper with side Darts you can reduce the solution of these Darts, starting to scribble from the top of the tuck, decreasing gradually the size of her waist and hips. In the same way increasing the size of the product raised seams on the shelves. Bust Darts to adjust undesirable. If you want to place a blouse and side seams, then you have to increase the size of the openings through the side seam of the sleeve. All seams after ripping should be carefully ironed, and only then begin to assemble the products according to the new seams. Note that you can increase the size of the clothing only if the difference in measurements is minimal. More than one size, to increase the finished product will be problematic. Women are always happy to update your wardrobe, however, there are some things that are difficult to separate, for example my favorite skirt. But time goes on and fashion changes, and with it change the preferences of women. Favorite short skirt is not satisfied. There is a solution – an old skirt to lengthen and to change her appearance. In the end, you have a wardrobe will be an interesting model. The option of lengthening depends on the model of the skirt. Lengthen the skirt by a strip of chiffon in the color of the fabric or mesh. With caution choose a grid. If the tissue is excessively hard, the torque on the tights you are guaranteed. The selected tissue, in this case, sew from the inside to the bottom of the skirt. Work the edge. Can also sew the lengthening strip of fabric to the skirt and the lining. This will give the impression of being out from under a skirt looks different. Lengthen the skirt by a strip of cloth of a different color. Sew to the hem a strip of fabric of the required width. To make the product complete complete skirt with patch pockets or the belt loops of the same cloth. Sew to the short skirt frill. Take a break from the same or similar quality fabric frill. Its length should be 1.5-2 lengths of the circumference of a hem, the fabric is laid in small folds. The skirt of the four wedges are cut on the bias can be lengthened due to the new yoke. This uplift zone. Cut the top of the skirt at a distance of 4 cm from the waist in an equity line. Tailor a new yoke. The height of the new coquette will be more 5-7 cm, than cut. Adorn long skirt with decorative elements (embroidery, applique or belt) in the color of new fabrics. Lengthen the skirt by changing the model. Uplift zone. Strut side seams and releasing the fabric, put a skirt on the hips. Due to this, the model will become longer. To the skirts of lax style for lengthening can sew fringe. To do this, sew the fringe to the hem. Decorate the joint with a ribbon or decorative stitching. Try to choose a fringe in tone to the skirt. To complement such model any decorative elements is not desirable. Let the fringe be the soloist in the model. Remember, the piece of fabric remaining when cutting skirts after some time it will be different in tone from the products are made, as cloth when worn slightly fade. 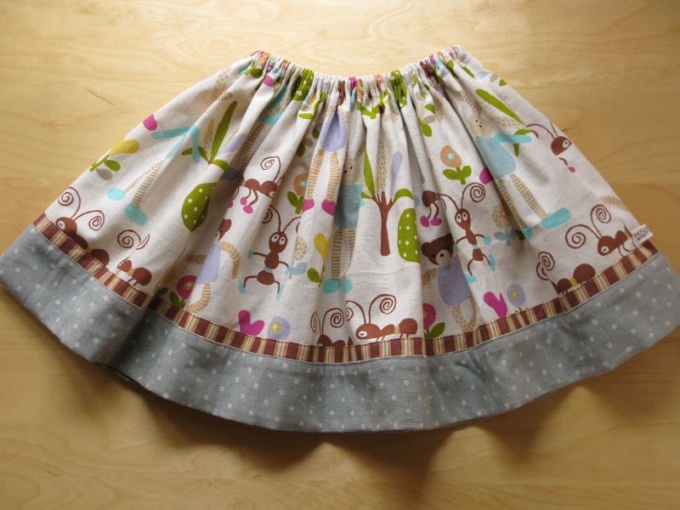 When choosing fabric for lengthening, try to blend in with the fabric of the skirt. Be sure to bring in the drapery of her skirt to apply and compare the quality. Sometimes perfect in every way dress the figure looks ridiculous or inappropriate due to the fact that his length is not enough only a few centimeters. In this case, do not postpone it to unnecessary things and we should try to increase the hem to the optimum size. Consider the hem hem of the dress. Sometimes its width is 3-4 inches, and often they are quite enough to outfit the villages perfectly. In this case, you need to carefully unpick the seam machine, or delete the thread, if the edge was processed manually. Smooth the fabric carefully Ratatouille. If wrinkles are smoothed out, soak the material and try again. Pick a thin fabric tonal base material dresses, vykroyte of her strip, whose length corresponds to the width of the skirt of the dress. Put her face in the hem, pristrochite on the sewing machine. Turn so that the tissue slices remained between the layers of the hem and the auxiliary strips. Iron, ensure that the front side was not visible other tissue. Fold the auxiliary strip, lay the line or manually process it a hidden seam. Again iron the hem of the dress. Use material suitable dress in texture and color. If the product has a straight fit, its hem to lengthen it by sewing to the rectangular piece of fabric. Dress will benefit from this, especially if you manage to successfully combine different types of fabric. The width of the insert can be any, so the mini model can be easily converted to MIDI. That the image was harmonious, can be decorated in a similar way sleeve. In addition to simple direct insertion dress can be lengthened at the expense of the shuttlecock. Item can be cut according to the principle "the sun" or they may be gathered along one edge a strip of cloth. If desired, decorate the dress with several flounces. Use lace and guipure ribbon with a crochet edge if you need to lengthen the hem of a vintage or romantic dresses. The upper edge of the decorative braid must be placed under the edge of the skirt and to lay the line. Due to the sheer lightweight texture of this lace insert will not burden the image. Very impressive dress that uses elastic in a contrasting color. Extend knit dress knit by using knitting needles or the hook. It is desirable to use thread of the same density and thickness as used in the creation of the product. Carefully type in the spokes with fishing line loops from the edge of the hem, tie a strip of the desired length. Hide the thread. The number of loops in the additional fragment of the dresses must match the number in the main part. If style and knit products allow, you can create a fishnet pattern on the edge of the hem with a hook.